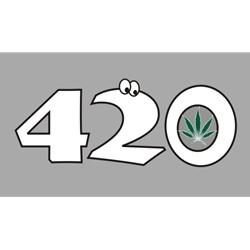 420 T-Shirt - $12.00 : Tightwad Tees , Screen printing, embroidery, and design services with no minimums and unbelievable pricing!! Available in many garment and color options with a 420 design including the classic marijuana leaf on front. Show your support of the legalization of marijuana or hemp products... or just tell the world you're a stoner. Now also available in tie dye for a few dollars more. Tie dye is only available in short sleeve t-shirts.